Shiba Park in the Snow, c. 1910. “The snow must have fallen nearly all the night for it lay deep this morning. Soon after 10, it became bright and clear, and I set off to see the temples in Shiba Park. Very few people were about, and in the park just a stray poet or two and a photographer. “I climbed one of the hills in it and before me lay the sea beneath the snow clad trees and temple roofs. I turned, and scarlet through the festoons of gleaming white glowed the fretwork of a pagoda. Up and down little hills I wandered, the great trees standing free as in a forest, and the ground, as in a forest, trellised with big roots. 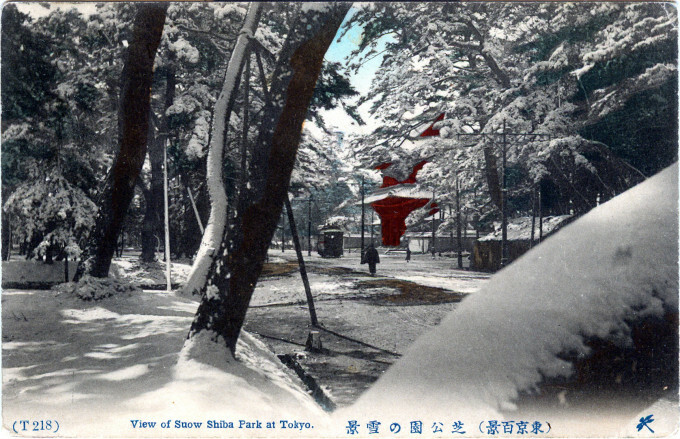 The snow hid the low bamboos and gave the whole hilly landscape such a look that one needed no imagination to fancy oneself in a distant mountain forest, till the curved roof and crimson sides of a temple showed between the trees. “In absolute solitude I walked on untrodden snow with no sight or sound of man – round me the musical clouds of snow that fell as the wind swayed the boughs of the tall cryptomerias above my head.